Jaguar is proud to announce a new era in its sports car lineage – the all-new XK. Like all great Jaguar sports cars, the focus of the all-new XK is firmly on the future, while acknowledging the marque’s rich history. It heralds a new era for Jaguar in terms of both design and engineering, and it is the most technically advanced Jaguar ever built. 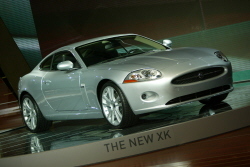 With this unique high-tech construction method, the all-new XK’s bodyshell is 31 percent stiffer than the previous XK’s and significantly offers a 10 percent improvement in power to weight ratio. The all-new XK is up to 90 percent stiffer and 180kg lighter than key rivals, with a kerb weight of just 1595kg. In the words of Jaguar's Chief Engineer Mike Cross, in charge of the all-new XK’s vehicle dynamics, "What the team has looked to engineer is a sports car with true all-round ability. That means it must be fast, outstandingly agile, and truly exciting to drive. It has to go quickly, stop quickly, and do everything in between in the way a Jaguar should. Yet it’s also a rational choice – the all-new XK will deliver a balance of superb driving dynamics and comfort that is the epitome of sophisticated sporting luxury." • On sale from early 2006, with prices announced at the beginning of the year. The use of beautiful lines and clean surfaces was crucial in defining the all-new XK’s more sporting character. In Jaguar design director Ian Callum’s words, "The fundamental values of Jaguar design do not change – not even since Sir William Lyons created the first Jaguar all those years ago. The entire design team worked with those values as we looked to create a car with clean lines, a purposeful stance and exquisite proportions. We took influences from our heritage and evolved them to produce a car that is beautiful, visually fast yet undeniably modern; just as Sir William's own designs were in their day." In one respect the all-new XK arguably has more in common with earlier cars like the original XKs and the C, D and E-types than it does with the most recent XK, and that is the way in which the shape wraps more tightly around the mechanical underpinnings. The way the well-toned skin stretches tautly over the structure is timelessly modern, sophisticated, and easy on the eye. The all-new XK is visibly more assertive and sporting than the model it replaces – a future classic in its own right. In true Jaguar tradition the all-new XK is also elegant and understated. It has classic, ground-hugging coupe proportions, with a long bonnet, steeply raked windscreen and rear window, arch-filling wheels, and minimal overhangs. The front-wing power vents are a new Jaguar styling signature; the distinctive oval grille opening, prominent bonnet power-bulge and practicality-enhancing rear liftback door all echo the E-type; while details like the sweeping front and rear light shapes and powerful stance establish Jaguar sports car design firmly in the 21st century. Inside – as outside – the all-new XK features clean, simple, modern lines. It uses traditional craftsmanship and contemporary luxury materials like finely stitched leather, contrasting with a choice of more high-tech trim surfaces including metallic finishes. The layout is driver-focussed and sporting, with excellent ergonomics and body-hugging seats, set low against the high waistline to give a strong ‘cockpit’ feel. With a longer wheelbase, wider track and taller roofline, the 2+2 layout has more interior space than the XK that it replaces. Indeed this flagship coupe leads its class in terms of front legroom and shoulder room and boasts a 20mm increase in front-seat headroom over the previous Jaguar XK coupe. Inside the cabin the minimalist instrument cluster houses two prominent round dials either side of an advanced high-resolution colour display based on thin-film transistor technology. This display is split into several zones showing vital information such as gear selection, cruise control information, low tyre pressure warnings and satellite navigation instructions, depending on market. A centrally mounted 7-inch touch-screen allows intuitive selection of climate, audio, navigation and telephone settings. Amongst the user-friendly advanced technologies in the all-new XK is the Jaguar Smart Key System, which provides keyless start with a push-button starter, and also optional keyless entry simply by carrying the Jaguar Smart Key in your pocket or bag. While the first striking impression of the all-new XK is delivered by its looks, its real essence is in what lies under the skin. The most far-reaching engineering feature in the all-new XK is its use of Jaguar’s Lightweight Vehicle Technology, the all-aluminium architecture that was introduced with the latest generation XJ saloon. It is unique in the industry as a complete aluminium monocoque body structure, as distinct from an aluminium spaceframe with separate aluminium exterior panels. Developed from aircraft industry methods, where strength and light weight are critical, Jaguar’s manufacturing process produces a massively strong but very light structure that is both riveted and epoxy-bonded. The new XK takes the Lightweight Vehicle concept a step further with extended use of aluminium castings and extrusions as well as pressed aluminium panels. Its remarkable strength and light weight come from both the way the bodyshell is constructed and the use of new jointing technologies developed by Jaguar and its suppliers. The all-aluminium rear liftback door is strong, light and simple to operate. It pivots on two hinges ensuring the edge of the liftback moves away from the operator’s head as the lid is raised. It also provides excellent rear visibility – rare in the sports coupe field. Beyond the exceptional body integrity and built-in deformation zones, the all-new XK is also available with a host of other safety solutions for protecting pedestrians as well as car occupants. Those include the shape and construction of the bumpers and bonnet, plus a completely new technology, the pedestrian deployable bonnet. This is deployed upwards away from its rear edge, in milliseconds, in the event of a pedestrian impact. This forms a safety zone between the bonnet and the engine and other under-bonnet hard areas to reduce significantly the potential for injuries. 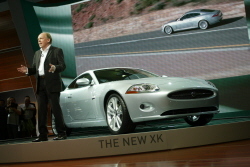 "As a team we worked from day one to ensure that the all-new XK delivered on every target set for the vehicle. In the case of the aluminium monocoque body structure, it delivers great advantages in terms of weight and strength and we were determined to utilise those benefits to produce a sports car with a blend of stunning vehicle dynamics and outstanding comfort." From launch the all-new XK will be powered by Jaguar’s renowned naturally aspirated 4.2-litre V8 engine which produces 300bhp SAE (298 PS EEC). This compact, lightweight engine is based on that fitted to the latest generation XJ saloon and has undergone significant development compared with the engine used in the previous XK, including new fuel-injection technology. The latest 4.2-litre engine satisfies Euro 4 emissions requirements as well as stringent US emissions regulations. For the first time in a Jaguar, drivers will be able to use steering wheel-mounted paddles to change gear with the new Jaguar Sequential Shift transmission. In either Drive or Sport Manual modes, very fast gear shifts are achieved by combining the use of one-touch paddles with an automatic blip of the throttle from the drive-by-wire engine management system during downshifts. Thanks to this positive torque enhancement control, the shifts are faster and more responsive than before regardless of the mode the driver has selected. The XK’s six-speed transmission introduces a new generation of automatic gearshift for Jaguar, replacing the familiar ‘J’ gate with the new Jaguar Sequential Shift system with Park, Reverse, Neutral, Drive and Sport modes. The fully automatic Drive mode adapts to individual driving styles, while a Sport Auto mode can also be selected. This offers an even more responsive fully automatic shift strategy, also utilising the automatic blip of the throttle to maintain ultra-smooth gear shifts. The all-new XK has a completely new, high-performance braking system, tested extensively over many hundreds of laps at the gruelling Nürburgring test track in Germany, where Jaguar has a dedicated research facility. The result is greater braking power and more responsive feedback to the enthusiastic driver. Larger, ventilated discs contribute to better pedal feel, optimum stopping distances and resist fade during extended hard use. The braking system also includes four-channel ABS, Electronic Brake Force Distribution, Hydraulic Brake Assist to increase brake pressure during an emergency stop, and Jaguar’s Electronic Park Brake function. Unlike conventional digital ABS systems used on many cars, the all-new XK’s ABS system can vary the brake pressure at each wheel using analogue valves in the hydraulic control unit. This gives more refinement to the hydraulic pressure control and allows drivers to benefit from increased steering input during heavy braking. The all-new XK’s Servotronic 2 steering is adapted for a sports car from the XJ saloon, to give easy low-speed manoeuvring with optimum high-speed feedback under all conditions. Beyond the exceptional new pedestrian impact safety systems, the XK also includes a host of other safety features. These include the option of a Tyre Pressure Monitoring System and run-flat tyres, Jaguar’s Protec dynamic headrest system to protect against whiplash injuries, Forward Alert which uses the optional Adaptive Cruise Control’s forward-facing sensors to scan the road ahead 10 times every second to warn of a potential collision, and the new switchable Dynamic Stability Control with Traction Control System (Trac DSC). A new active front lighting system is also offered as an option on the XK, enhancing the bi-xenon intelligent lighting that is standard on the car. This feature provides enhanced visibility in the dark during higher speed cornering by swivelling the dipped beam lens depending on road speed and the angle at which the steering wheel is turned. Like any of the great Jaguar sports cars of the past fifty years and more, the all-new XK pushes the boundaries of sports motoring. It is the most technically advanced Jaguar ever, and undoubtedly one of the most beautiful. It is lighter, faster and better equipped than the model it replaces, with substantial improvements in performance, driving dynamics, braking, safety and economy. Being a Jaguar, it combines the comfort, style and craftsmanship of a luxuriously equipped grand tourer with the driving dynamics of a true sports car. It captures the unique joy of driving that Jaguar drivers expect. In the finest Jaguar tradition, it is a truly beautiful, fast car, the product of advanced engineering and fine craftsmanship. It offers style, comfort and luxury. But it also keeps true to what sports car motoring is about – and that is the undiluted thrill of driving.